The first clear round in the jump-off would be produced by Wilhem Genn aboard BUGATTI in a time of 45.29. Genn's lead was short lived, however, as Mathis Schwentker (pictured to the left) rode next, jumping clean in a time of 43.07 aboard NKH CARUSO. Nayel Nassar was next to go. 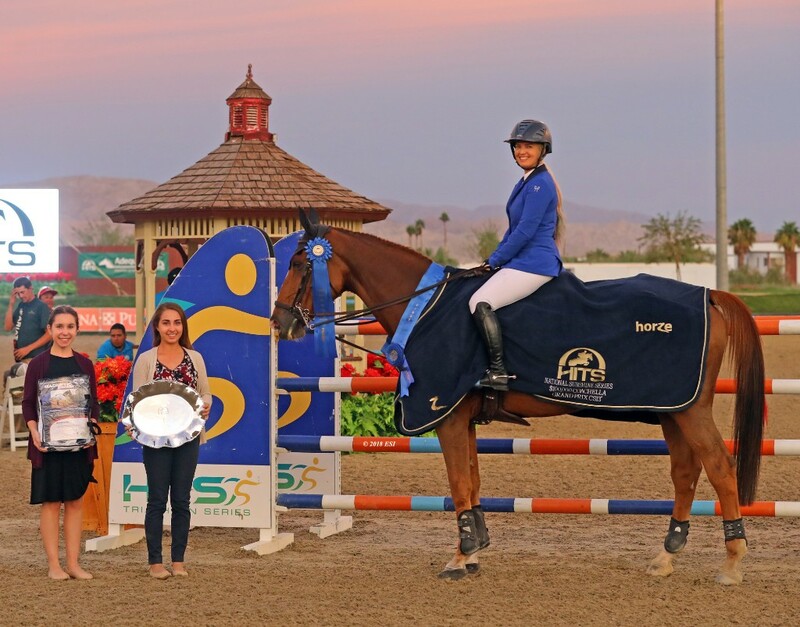 With a victory already in the books from Thursday's $35,000 Coachella Welcome Stake, Nassar and LORDAN had their eyes on another victory, galloping to the last fence in attempt to take the lead. Nassar was shaken out of the saddle in the air, but managed to stay on through the timers before performing an emergency dismount. The dynamic duo would finish with a four fault time of 46.29 for fourth place. Bond returned for the jump-off next, aboard her 14-year old chestnut mare CHELA LS. 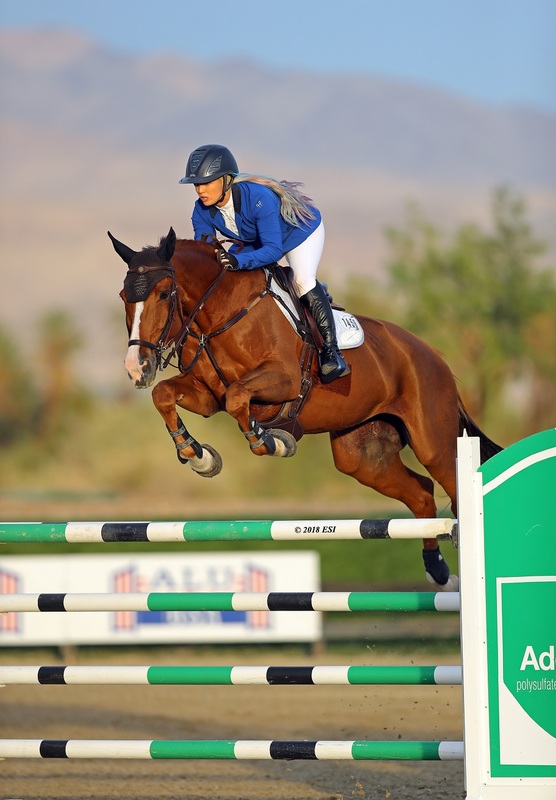 After a one-two finish in Saturday's $40,200 Coachella Classic, Bond's confidence was apparent as she entered the ring. A quick clean round in 41.86, more than a second faster than Schwentker, gave Bond a commanding lead with one rider left to show. "I go out there and do what's right for her [CHELA LS]. We have been partners for a while now and I walk [the course], make a plan, and stick to it," Bond said. "She isn't one to touch the rails so that part of her makes my job easy, but when she is wild, crazy, and strong it works against me. Today, she was perfect." Last to go in the jump-off was Uma O'Neill aboard CLOCKWISE OF GREENHILL Z, finishing with four faults in a time of 44.20 to claim seventh place. Bond says her plan with CHELA LS is to continue through National Sunshine II for the Longines FEI Jumping World Cup Qualifier, then show at [HITS] Thermal and [HITS] Ocala this winter. "I don’t know if I'll go to World Cup Finals if I qualify. It's been an interesting year," Bond said. "I don't ride for anyone else but myself anymore," she exclaimed. Don't miss out as the excitement continues at National Sunshine II! You can catch all the action live on Showhorse TV! 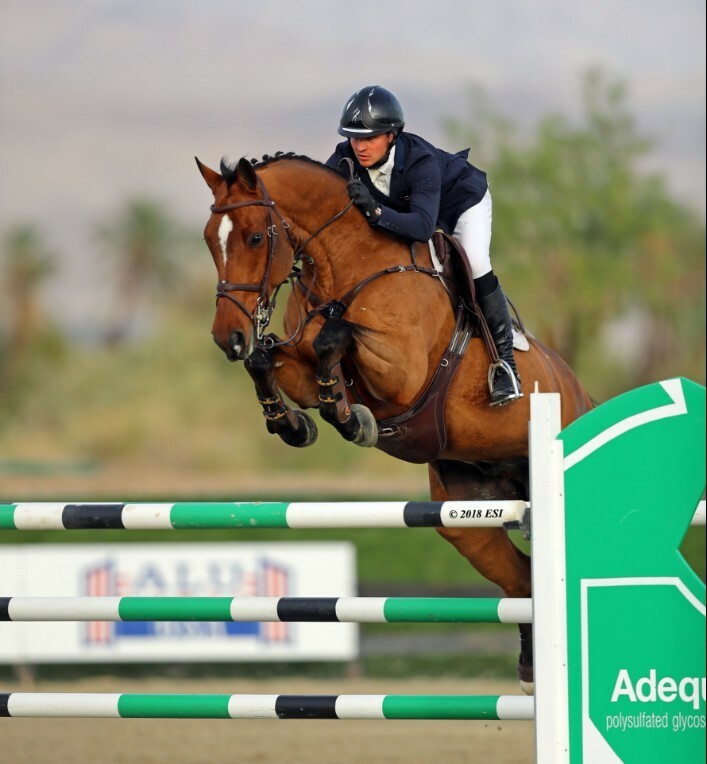 National Sunshine II features the $100,000 Longines FEI Jumping World CupTM Qualifier. Stay up to date with all of the upcoming HITS events via Facebook, Twitter, Instagram, Snapchat, and HitsShows.com.